Wadi Qana is a place almost as soothing as it is beautiful: a fertile valley with seven main natural springs and nine smaller ones, and the endless Wadi Qana river running through it. The river meanders from Huwara, south of Nablus, to Jaljuliye, south of Qalqilya, and then flows into the Yarqon, or Naher el Ooja River. Wadi Qana is between two ranges of hills, making it very suitable for citrus plantations. Indeed, the orange trees and lemon trees spread along the river and shine in the morning sun. Now the central fact of my life [December 9, 2007]—no dreaming here, nor fantasizing, nor wishing, nor imagining—is my cold. Full-blown. Very painful. Sinuses infected. A huge sinal headache. Luckily I managed to sleep passably well, but I canceled the plan to reside overnight with Fareed because of the danger of infecting his children, Lena in particular, and my discomfort. I would have been doubly miserable staying with him in the small village of Qira. I’ve not lost my olfaction, nose is still mildly runny, my voice is much lower, I hope the headache will disappear with aspirin and caffeine, liberal doses of both, and I’ll manage to get thru the day, the morning at Quaker meeting, later at the Pronto cafe or the nearby sweets café for computer work. When did I last have a cold or flu, or any other insignificant illnesses? I have no idea. I don’t remember. I should keep a journal or ledger of such problems so I can track my health. Falling asleep last night I yearned for someone to care for me. Who might it be? On to more important matters, namely the trip to Salfit. Joining S who has been hired to research a factory in the Burkan (aka Barkan, Burqan, Barqan, etc, the spelling of many Palestine/Israel areas annoyingly flexible) industrial settlement block near Ariel, Beigel and Beigel (making food products, bagels among them), we first visited folks at the Salfit municipality and then the center for trade union workers, mainly for leads for S. All the conversation was in Arabic, I understood nothing, sat thru as much as I could tolerate with my cold and lack of Arabic, then wandered around outside, returned inside and read, eventually joining the guys for coffee and goodbyes. Another interview at the Protective Defense Forces office for more leads for S—men with guns much in evidence—and finally we were in the field, led by one of the men from the trade union center. Now matters became more interesting for me. We went down a bumpy gravel road into a wadi that I’d visited last year, April 2006. I saw then the construction of a sewer pipe that was would carry all of Salfit’s sewage into a treatment plant funded by a German bank. Israel rejected he first site chosen for the plant, probably on the grounds of “security.” The Palestinians chose a second site, the pipe extended. I saw that the pipe had all been laid; we saw the first treatment site, not the second which was much deeper in the wadi. Nothing has been built, blocked by the Israelis. The various settlements, including Ariel, apparently dump untreated wastewater down the hills and into the wadi, contaminating the springs and other sources of fresh water for the Palestinians. Worse, 2 weeks before my last visit, maybe during the heavy rains that drowned one young man against a portion of the separation fence, the sewage overflowed into the wells that pumped up fresh groundwater for Salfit. This source was destroyed. Eventually the municipality was able to clean and reuse the system; the Israelis contributed nothing to this reconstruction, as far as I’m aware. The flood ruined much of the crop raised in greenhouses. Subsequently the Danes built a retaining wall to prevent a mixture of sewage and fresh water should flooding occur again. But nothing is being done to treat the settlement wastewater. They are not subject to Israel’s laws which apply only to Israel within the Green Line. 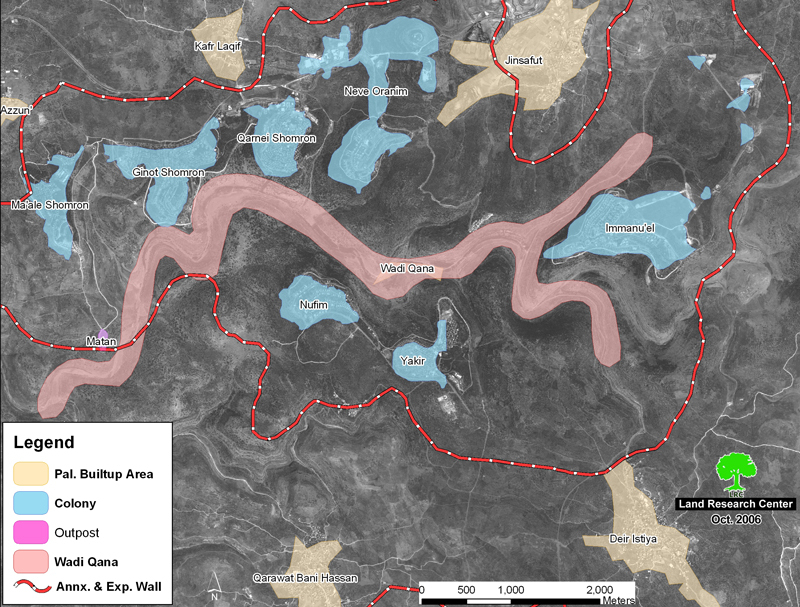 According to the Applied Research Institute of Jerusalem, 80 factories from Ariel’s Burkan industrial zone discharge 0.81 million cubic meters of wastewater per year into nearby valleys. All this wastewater and the sewage have formed a river through the agricultural lands of the villages of Kifr al-Dik and Bruqin. These poisonous streams have led to the death and ruin of trees and crops located in their immediate vicinity. We met a farmer who showed us the system of fresh water storage and pumping, then invited us into his greenhouses to sample from a multitudinous array of cucumbers. Slippery mud coated our boots and shoes; I constantly worried about cascading into the slime, depositing on me a souvenir of this day’s exploration. That threat, added to the annoyance of my cold, taxed my concentration powers greatly. The man from the trade union center who’d accompanied us seemed to know a great deal about the water situation. I asked, “From where do you get this information?” He answered, just by living here. Later, Fareed told us the flooding disaster had gained much media attention. Another part of the story: starting about 6 years ago, just after the beginning of the Al Aqsa Intifada, local settlers brought pigs on trucks to the greenhouse area, releasing them to forage thru the gardens. Needless to say this ruined much of the crop. The farmers have no recourse. Prior to the Intifada the farmers could shoot such pigs, which have their genesis as wild pigs. Now this would bring instant and violent retaliation from the army and the settlers. Farmers have tried to prevent pig incursions by draping old colorful clothing on barbed wire fences and by constructing fences of brush. To no avail. The most recent incursion, ruining a bed of lettuce, was two months ago. It has become a frequent occurring that colonists of Ariel release large numbers of wild pigs into Palestinian lands. In addition to the financial damages caused by the pigs to Palestinian crops, psychological problems (stemming from fear) has been recorded between the children and the elderly in the area as these pigs usually attack everyone that gets near them. So far, there were 4 reported cases in which children sustained critical wounds due to pig attacks in the region. I also learned from this farmer that his bees have been dying, some 30% in the last year. His view: from the pesticides Palestinians use for their orchards, not connected with the global bee die off. According to one study, the first trace of pollution from the Barkan industrial area is expected to reach groundwater within 15 years. Within 30 years, traces of that pollution are expected to reach wells in the Yarkon area and others, which currently provide 37 million cubic meters of water a year. Examining sewage from Ramallah, too, the study estimates that nitrate pollution will take approximately 15 years to reach groundwater. Initially it is expected to cause low concentrations of pollution in groundwater, but those will then rise steadily (Shuval, H. and Isaac, J., 2000, “Environmental Protection of the shared Israeli-Palestinian Mountain Aquifer”). Next we met Fareed at the roadblock on Rt 60 and his village’s road. Due to the matrix of control, as he’d explained and demonstrated on my last trip, Rt 60 and the fence block transit between Salfit and Qira. What had been a 15-minute 4 km (3 mile) ride between F’s Salfit office and home became a 90-minute 25 km journey over winding narrow roads. After confirming that S and I wished to visit water sites, he brought us to an area in Wadi Qana his family had visited for picnics and swimming when Fareed was growing up in Qira. No longer. Pipes and hoses from hilltop settlements now spewed their raw poisonous sewage into the wadi, ruining the springs and threatening the livelihood of those living there. We walked and rode at least 3 km into the wadi, smelling the sewage, discovering leaks in the system, marveling at the abundance of orange and olive trees growing there, wondering about their purity, and then finally met a family who lived there. They explained more of the situation. 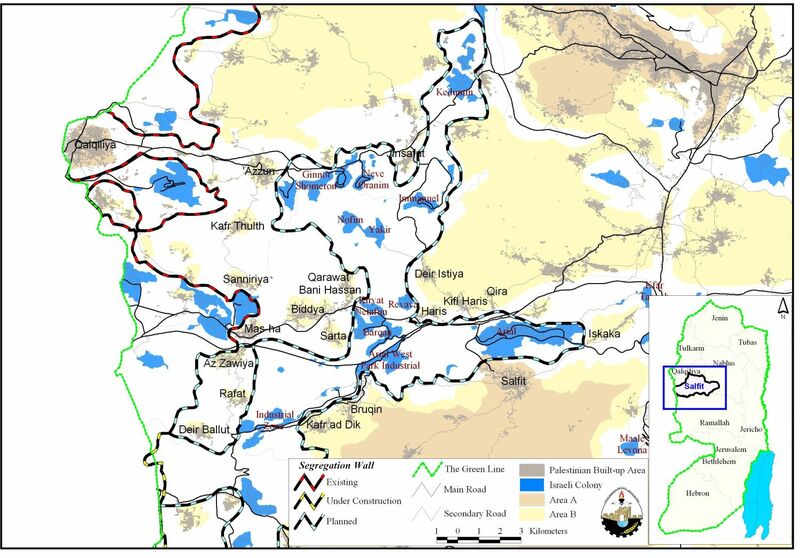 Only partial data was provided to the authors of this report on the treatment of sewage from Israeli settlements in the West Bank, amounting to 15 million cubic meters per year. Despite the existence of precise data on the issue, the Israeli Water Commission refused to provide detailed reports. Instead, it claims that 70% of the settlements’ sewage is treated satisfactorily, while the remainder is either treated to unsatisfactory levels or is not treated at all. Data obtained by the authors of this report shows a somewhat different picture. Monitoring results from 1999 suggest that only 6% of the sewage conformed to Israeli treatment standards (Environmental Protection Association Samaria and Jordan Valley, 2000), while 48% of the sewage was treated inadequately, or not treated at all. Monitoring results for 17% were not available, and the status of 7% was unclear. Several sewage treatment projects for Israeli settlements are currently in various stages of implementation. Once completed, they will treat the remaining 22% of the settlements’ sewage. These projects include the Qana Stream carrier line, upgrading of the sewage treatment plant of Barkan Industrial Area, sewage treatment plants in Efrat and Beit-Aryeh, and upgrading as well as building of sewage infrastructure in Modi’in-Illit. I remain puzzled about the local hydrology. Where did the sewage pipes discharge? Why didn’t we find large pools of sewage? Did the pipes enter another larger buried sewer pipe that we did not see, discharging later? Did all this eventually enter Israel and then the Mediterranean? Later S confided to me that not only does most of the world know nothing of this story, but even in Palestine, among his friends, expect possibly for a few activists, few know or care. We dropped off Fareed at his car, and met him later to drive to his home, there to feast on traditional Palestine food, meet his family (remeet for me tho I doubt any remember my visit), see again the thriving Lena who I and others have written about, her story of renal failure due to contaminated cistern water, and finally after a full day, drove home with S. his home is built over his ancient family home. We viewed the surrounding countryside near nightfall, dominated by Ariel. S asked me to make a panoramic series. The roof is designed to collect and direct water into the cistern beneath the house. The solar heating panels for water work, a rarity it seems, most I’ve observed are broken. Off to one side were the remnants of an old Arabic house. Fareed’s house’s interior is elegant and spacious. He hosts his parents in a small apartment off to one side. The house is on one of Qira’s main roads. During an incursions a small part of the house was destroyed when tanks rumbled thru. S is a man of about 25 years with a Master’s degree in human rights sociology from the University of Essex in the UK, a BS from a small private college in Wisconsin, originally from Ramallah, now working independently as a researcher. He has a contract with a human rights organization from the UK and the Netherlands to explore the company Beigel and Beigel, so that the boycott campaign against them can be launched. He hopes to visit the factory, possibly I’ll return with him to more fully explore the Burkan block. With Fareed in 2006 we’d only cruised by it in a car, stopped momentarily to photograph the wadi that collects much of the block’s discharges. This time I had my long telephoto lens and could show more accurately the cattle and the discharge pipe. The industrial settlement has over 80 factories, many of them heavy polluters, like a smelter. The list includes, besides Beigel and Beigel, aluminum, fiberglass, plastic, chemical, lead and oil factories. They discharge solid waste, paints, and other toxins extremely hazardous to the environment. S will use some of my photos in his report. Raised all his life in Ramallah, out of the area only for university training, he now wishes to move to Haifa and become an academic. His parents once ran a school in Jerusalem, he has a sister in the states. This is a gradually unfolding hydropolitics story that I’m privileged to examine and show. While finishing dinner with Fareed and family he asked me, “What’s the best part of returning to Palestine for you?” I joked, “The sweets and my barber.” “And returning,” I added, “meeting people like you over and over, going deeper into the topics I’m trying to photograph.” Fadia (who he’d heard about thru Facebook because both have Facebook pages and I’m a friend of both) has implored me to go further with my project, that I’m only superficial at this point. Thus the return visits. Fareed plans to move to Ramallah. Partly this is motivated by his job promotion, from coordinator of the Salfit district election commission to head of the publicity section of the entire election commission. His office is now in Ramallah, a commute of at least one hour. And partly because of the growing restrictions in his area. The separation fence around Ariel is completed; the larger wall is not, on hold since, unusually, the US government has objected to its route, some 20 km (13 miles) inside the Green Line, a blatant and illegal confiscation of Palestine land. If completed, this wall would separate north from south West Bank. I suspect he also foresees better educational opportunities for his two children. He’s acquired an apartment, adjacent to a Christian school with a good reputation. By next summer he hopes to finish the move. Thus no more opportunities for me to visit overnight in Qira or to have a friend in Salfit who knows the water situation. Interesting note, and quite objective. Please let me point out that the Barkan industrial area “smelter” is in fact in the Ariel Industrial Area (Barkan is in the other side of the road) and it is not a smelter, but a used mineral oil recycling plant working with Italian technology. It is supposed to be “green” (but it smells badly). I hope you are open/honest enough to see that the stories that the Palestinians tell are not always true. Specially dont believe stories that say that they dont do something because the Israelis (we) will not allow it. We would be delighted if Shalfit would operate the sewage treatment plant donated by the Germans, we would applaud if they did something to improve their water supply system. Unfortunately, not one of the sewage plants in Palestinian areas is working, and their sewage is yes polluting the mountain aquifer, which we share for drinking. The most terrible situation is in Hebron, which like most Palestinian cities, is on the highest point of the Judean and Samarian mountains. Hebron has a leather industry that use chrome, and this chrome laden sewage filters down to the aquifer, contaminating irreversibly the aquifer. We would like them to do something. But their mind is in politics and warlike fantasies. thanks for your proposed corrections. i was not aware of most of what you wrote. when i have time, after my current ip trip is over (in a few weeks, i’m now exploring coastal israel) i intend to corroborate the info and make corrections where appropriate. i definitely agree that some of what palestinians claim is not true. one problem i’m having is limited access to israeli experts and installations. for example i’ve tried to gain permission to photograph the desalination plant in ashkelon and meet with personnel there. so far with no success. maybe you have ideas for surmounting this challenge. The pig story is just ludicrous. Are you naive! 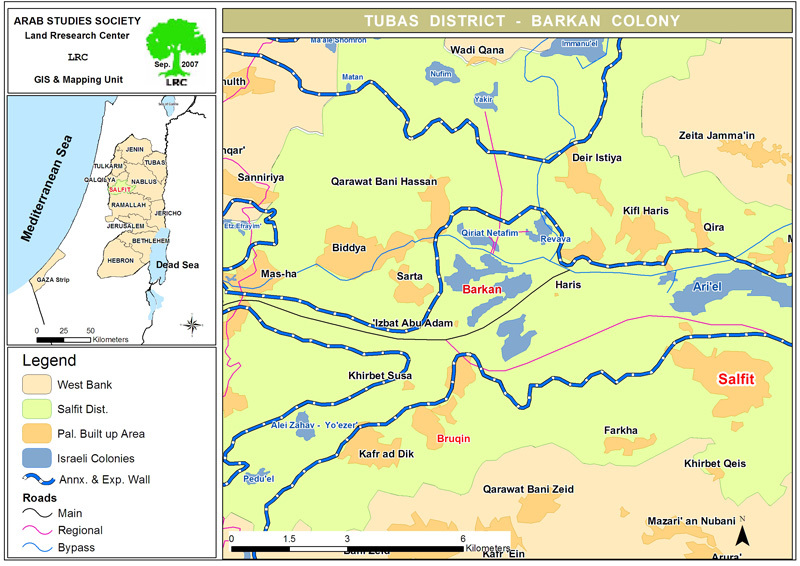 Both Barkan and Ariel Industrial areas have wastewater treatment plants and discharge tertiary treated water. The city of Ariel (about half of Salfit’s population) has a WWTP and it upgrading is in the planning phase. None of the Palestinian villages and cities in the area has working WWTPlants. I am working on the reuse of “Israeli” wastewater for irrigation, we have no water, you know.